If you like chocolate and you happen to be passing through Bologna this week, you’re in for a treat! The 2016 Cioccoshow is kicking off today. If you like chocolate and you happen to be passing through Bologna this week, you’re in for a treat! 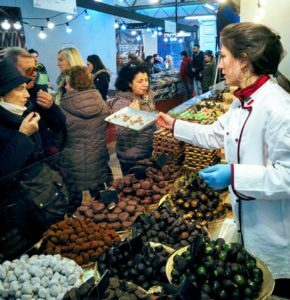 The 2016 Cioccoshow is kicking off today: it’s a big chocolate fair, stretching through the centre of Bologna, where you can try and taste a wide variety of products: hot chocolate, nuts and chocolate, marshmallows covered in chocolate… you name it! But if you’re not keen on chocolate there’s no need to worry! Bologna offers a broad selection of events that might be of interests to you. The 2016 Bologna Jazz Festival, for example, still has some nights left for you to catch. There are many concerts, exhibitions and events you can look up on their official website. Hurry up, it ends on Sunday 20th November. That’ll be quite all right, no need to worry! Bologna was named Creative City (in the field of music) by UNESCO in 2006. So it is no surprise that you can find numerous events just by looking them up online depending on your period of stay. Bologna is the home of several artisan excellences for chocolate within its walls, you just have to look for them while strolling down our porticoes. Let us suggest Majani as one of the oldest and most famous chocolate laboratories that are based in, and originally from, Bologna. Ever wondered what chocolate salami tastes like? These are only a few things you could do in our town. For more, don’t forget to check our website or come to one of our food tours with us!